Toro Energy Limited is an ASX listed uranium development and exploration company with projects in Western Australia. Toro’s tenure in Western Australia is also prospective for gold and base metals. Toro is committed to building an energy metals business with the flagship Wiluna Uranium Project as the centrepiece. 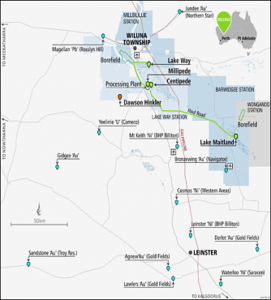 The Wiluna Uranium Project consists of the Centipede, Millipede, Lake Maitland, Lake Way uranium deposits 30km to the south of the town of Wiluna in Western Australia’s northern goldfields. The Wiluna region is an historic mining precinct dating back to the late 19th century. It has been a prolific nickel and gold mining region and therefore has well developed high quality infrastructure in place. The Wiluna Uranium Project has received federal and state government environmental approvals for mining uranium at the Centipede, Lake Way, Millipede and Lake Maitland deposits, the construction of a processing facility and all mine and processing related infrastructure, tailings storage facilities and finished product transport to port. Minority equity and financial instruments in Strateco Resources Ltd which owns the Matoush Uranium Project in Quebec, Canada.